Last year, Volkswagen did something extreme to the Jetta: They Americanized it. Yes, they made a Jetta specifically to suit what they believe is the compact sedan we want by completely redesigning the exterior, changing around the features and standard options, and – most importantly – lowering the price. Doing so unfortunately meant cutting costs in certain areas, and the Jetta certainly feels a little less expensive across the board, including in its performance levels. That’s why we’re very much into the Jetta GLI. It’s the top-of-the-line Jetta model that remedies some of the ills we found in the standard model. In fact, performance is featured front and center here. A 2.0-liter turbocharged four-cylinder generates 200 horsepower, and VW’s DSG transmission is available too (though enthusiasts will be pleased to know a six-speed manual comes standard). They kept the old multilink rear suspension setup and the GLI has a bevy of exterior and interior mods to help it stand out from the common Jetta lineup. Of course, this Jetta is a considerably pricier proposition than the base model, but perhaps America is willing to pay a little more for a lot more fun. We love the efficient and powerful turbocharged engine, and the suspension feels superior to the standard Jetta. Gas mileage numbers are impressive. Technology integration is great, and the touch screen interface is high quality. VW offers free scheduled maintenance for three years or 36,000 miles. Jetta interior quality is underwhelming compared to the last generation, and leaving some options off the menu means you end up with odd empty spaces on the instrument panel where buttons should go. 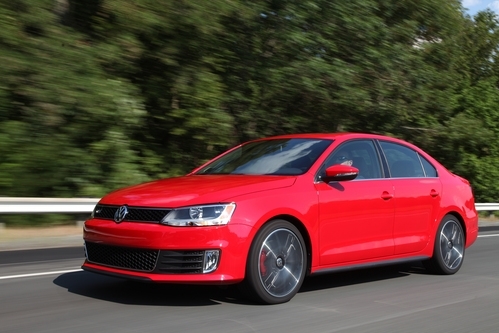 Pricing puts the GLI in range of some strong (and more powerful) performers in this segment. What a difference a new engine makes… and an independent sport suspension, and variable electric steering, and rear disc brakes. What we’re hinting at is that the Jetta GLI is far removed (at least under the skin) from its regular Jetta sibling. Cornering and handling is considerably improved; the GLI slides easily into bends and minimizes bumps in the road without becoming unsettled. The turbocharged inline-four – the same one found in the Golf GTI – is simply fantastic. It spools speedily, and acceleration is quick, seeing the GLI to 60 mph in 6.8 seconds (compared to the Jetta’s eight seconds). Despite the strong torque numbers, we experienced zero torque steer, and the deep engine note is music to our ears. 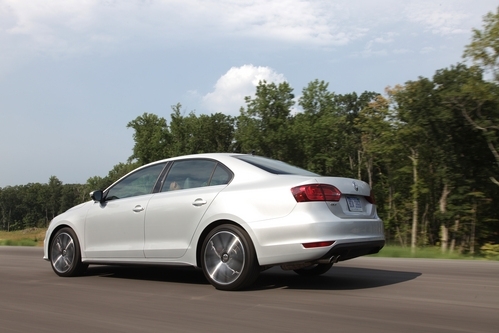 The GLI does this all without compromising comfort or smoothness during the drive as well. The seats are typically body hugging and the cabin is quiet. VW swapped out the Jetta’s standard 2.5-liter with 170 horsepower for a 2.0-liter turbocharged inline four-cylinder engine that boosts horsepower up to 200 and torque to 207 lb-ft. An optional six-speed DSG transmission with tiptronic and sport mode is available in place of a standard six-speed manual. Rear disc brakes and hill hold are also included. Despite the increase in power over the standard Jetta, the GLI attains the same 22 mpg city, 33 mpg highway fuel economy numbers. The similarly matched Mitsubishi Ralliart doesn’t come close to that, but you’ll find equivalent numbers in the Hyundai Sonata Turbo and Kia Optima Turbo. The GLI comes standard with plenty of comfort and tech features. The list is long: standard leather-wrapped steering wheel with controls, auxiliary input jack and USB connector with integrated audio controls, touch screen, Bluetooth, and sport seats are just a few.A GLI Autobahn package ($2,050) includes 18-inch wheels, a sunroof, dual-zone climate control, Fender audio system and leatherette seating, while a $900 navigation system is also on hand. This latest generation Jetta grew 3.5 inches and it shows in the spacious cabin. Interior quality isn’t as strong as you may expect from VW, but the GLI trim adds a few nice touches, like red contrast stitching on the seats and optional leatherette seating. Bright gauges and a clean, simple instrument panel round out the interior look. Carrying the new corporate face found on the sixth-generation Golf and GTI, the Jetta loses the soft, pudgy styling of the old car. The exterior of the Jetta isn’t too distinctive, but the GLI trim gets darkened taillights and a honeycomb mesh grille to help it stand out. 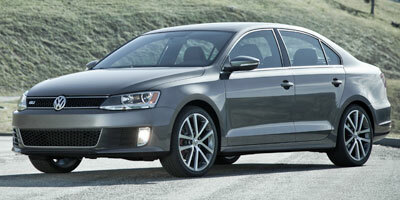 The GLI starts at $23,495, rising to $25,545 for the GLI Autobahn trim. Its direct competition comes from the nearly identically priced Honda Civic Si sedan and Mazdaspeed3. But unfortunately for the GLI, its price starts close to a number of well-appointed, more powerful models, including the Hyundai Sonata Turbo and the Kia Optima Turbo. The Subaru Impreza WRX is in the area as well, at $25,495, and even the $28,095 Mitsubishi Lancer Ralliart is within range. Pricing is the Jetta GLI’s biggest hurdle, thanks to the more powerful competition, but that’s hardly its downfall - mainly because the GLI is the best Jetta you can buy right now, full stop. Even the exterior looks more engaging. Considering how well the Jetta is selling right now, we can only assume that this impressive GLI model will be the one getting added to the wish lists.